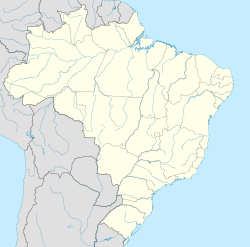 Teófilo Otoni is a city in northeast Minas Gerais state, Brazil. The population of the municipality was 140,067 in 2013 and the area is 3,242.818 km2. The city is named after Teófilo Benedito Ottoni [pt] (Vila do Príncipe, 27 January 1807 - Rio de Janeiro, 17 October 1869), who was a provincial deputy representing Minas Gerais; a national deputy and a senator in the Empire of Brazil from 1864 to 1869; and founder of the city of the same name. It lies at an elevation of 319 meters on the Todos os Santos River, a tributary of the Mucuri. It is part of the Valley of the Mucuri, a region which includes 27 municipalities. Situated on the Rio-Bahia Interstate Highway BR 116, it is 130 km. north of the regional center, Governador Valadares, on the Doce River, and 478 km north of the state capital, Belo Horizonte. It was founded in 1853 by German colonists and given city status in 1878. Teófilo Otoni is a statistical microregion including the following municipalities: Ataléia, Catuji, Franciscópolis, Frei Gaspar, Itaipé, Ladainha, Malacacheta, Novo Oriente de Minas, Ouro Verde de Minas, Pavão, Poté, Setubinha, and Teófilo Otoni. The population of this region was 253,679 in 2000 and the area was 11,296.80 km2 (roughly the size of The Gambia and a little larger than Jamaica. The population density was 22.46 inhabitants/km2. Teófilo Otoni is a trade centre for an agricultural hinterland in which livestock raising is of some importance. The city has small-scale manufacturing and food-processing plants. Poor soils for agriculture and lack of industry have made Teófilo Otoni a major source of immigration to other regions of Brazil. In 2005 the GDP was R$723 million, of which 515 million was from services, 101 was from industry, and 37 million was from agriculture. Industry employed about 2,000 workers, services employed 8,800 workers, and public administration employed 2,300 workers. Téofilo Otoni's strongest economic sector is a diverse and bustling service industry. The city has several commercial areas and a shopping mall, City Mall. Prominent businesses in Teófilo Otoni include Pharmacy Indiana, Stationery Graffite, the store Magda Magazin, and Ramos Transport. The trade in precious stones is also quite important as the city is considered an International Capital of Precious Stones, which comprises a good portion of its economy. The city was granted the FIPP (International Fair of Precious Stones) recognized worldwide. Natural pasture land: 125,506 ha. Extensive mining and gem trading for aquamarines, topaz, brazilianite, and various forms of quartz take place there. A Gem and Mineral Show (Feira Internacional de Pedras Preciosas (FIPP), is held here every year, attracting international buyers. The fair provides the opportunity to buy both rough and cut stones directly from local producers, miners and cutters. This page was last edited on 12 April 2019, at 12:17 (UTC).